Happy Sunday lovelies! Wew. I cannot remember exactly when was the last time I pampered myself with nail spa. I love nail salons, so much, especially if they have a very cute and nice ambiance. 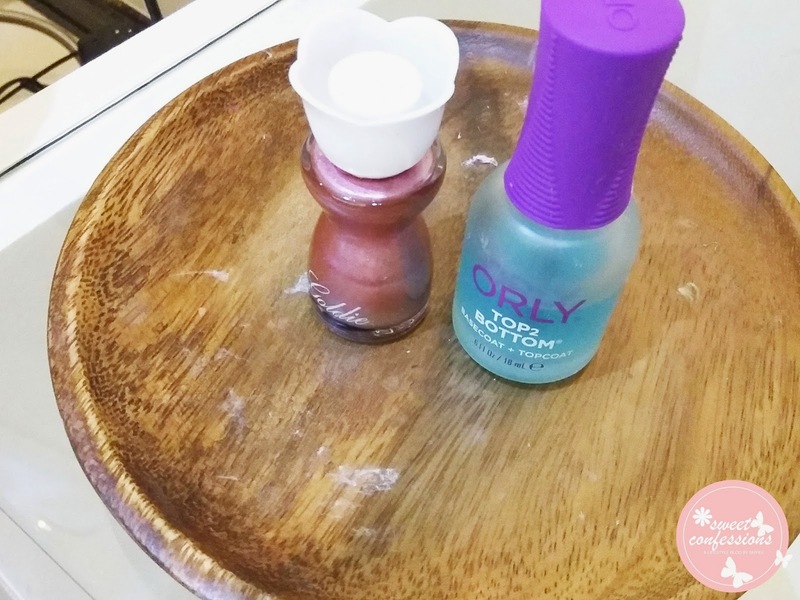 I have featured few of my nail salon tripping, some are still on pending status, but if you know me personally, I easily get captivated by things and places with any connection to nails or nail tools. Recently, I have been sponsored by Chic Centre with their Kathryn Bernardo Pastel Colors collection, and I honestly love nail polish. 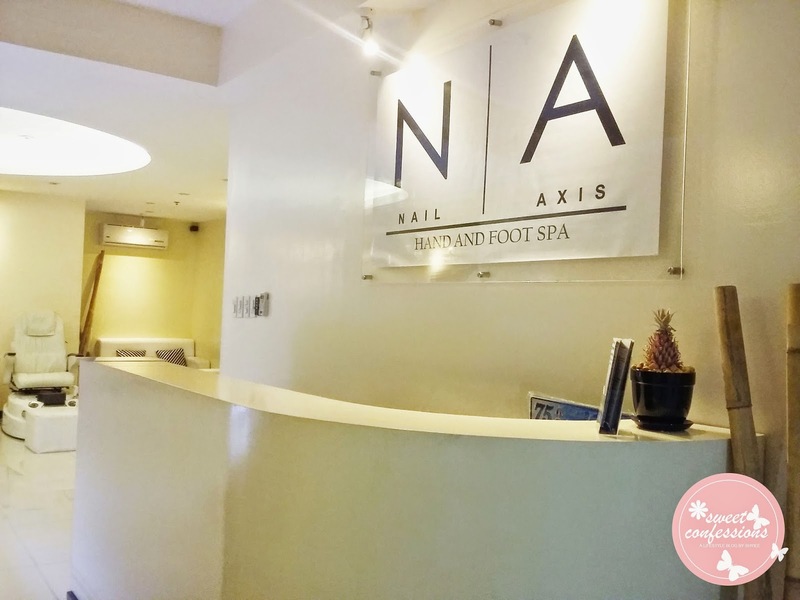 Anyways, I'm lucky I was one of the few bloggers who was chosen to experience a luxurious nail pampering at Nail Axis Hand and Foot Spa. 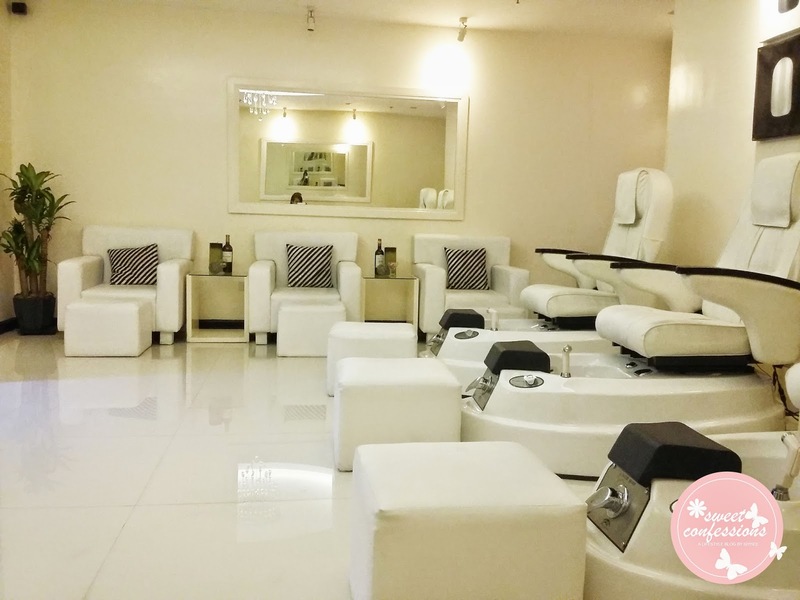 I don't know why I was chosen, but nonetheless, before I share my experience, I want to thank the owner for letting me experience this Nail Spa session at your salon. Elegant, Luxurious, Classic, Clean, and High-end - five words that best summarizes the whole place. You wouldn't imagine that this nail spa is owned by a 23-year old man. Seriously. Even I, can't believe that a guy, my age owns a luxurious nail spa like this. John Cava, Hotel and Restaurant Management graduate, mentioned that the nail salon is hotel-inspired, and that he wants the clients to feel the convenience of a hotel service. 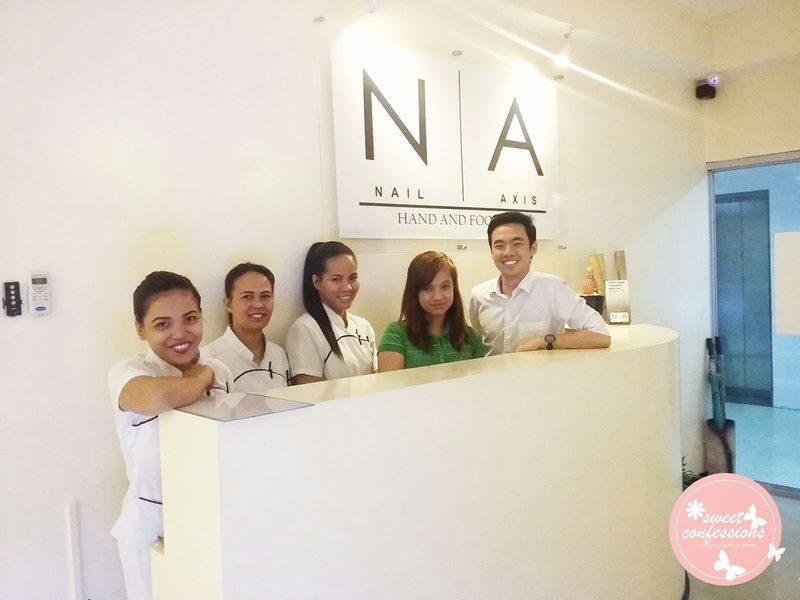 He envisions this nail spa to be one of the leading 5-star nail salons in Metro Manila. When I first entered the unit, I was surprised that it wasn't small as I expected it to be. 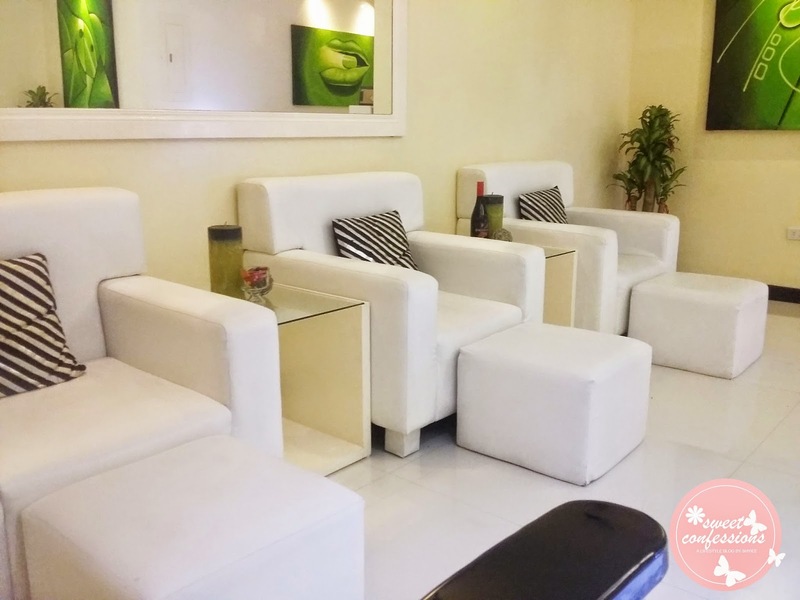 I saw the photos before I went here and I was expecting that the salon is smaller like any other nail salons I visited. But I was wrong. You could see much space and it's interior design is good. The couches for the deluxe service are very soft. I also like the theme because it looks really clean and classy. I like the way they collect their guests' details by simply letting them fill up deets just like when you're checking in on a hotel. 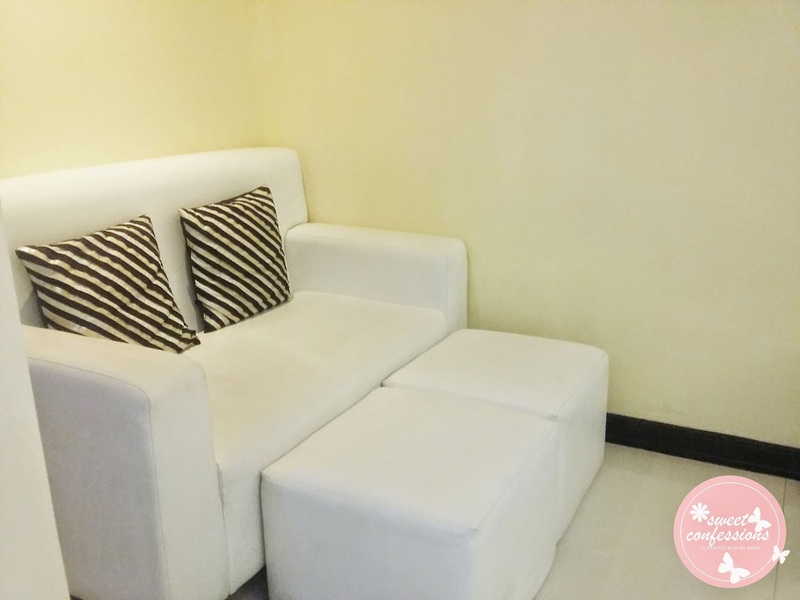 It is also gender-friendly since the main theme is black and white with a touch of green, so if you want to bring your boyfie or hubby with you during your pamper session, I swear that he wouldn't be intimidated with the ambiance, since there's no much pink and glitters. 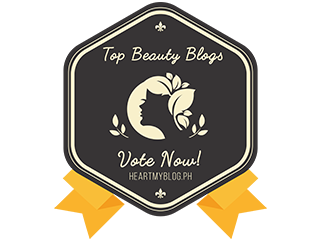 Your other half will surely join you with the pampering. The music completes everything. There are no dull moments. I, actually, felt like I was on a cruise, or in a 5-star hotel event because of the classic and instrumental music playing. 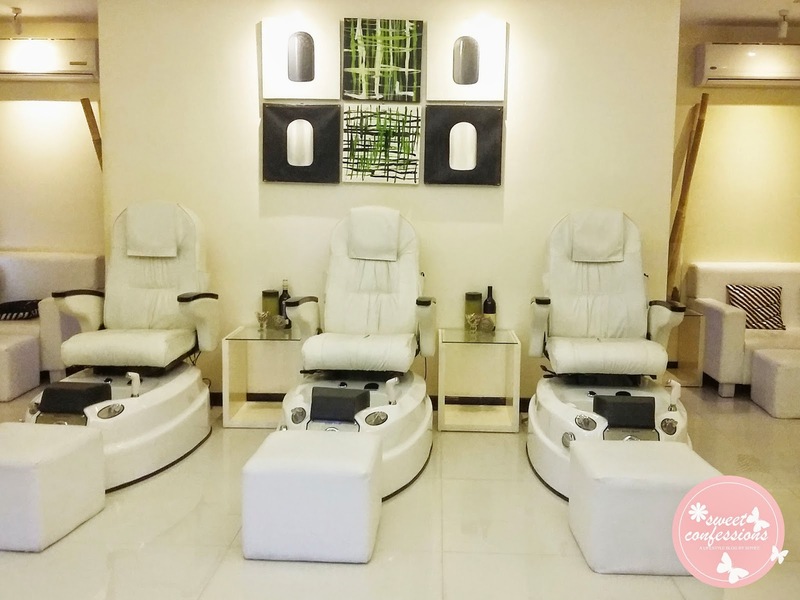 This one is their infamous jet spa chair where you get to experience a very chill back massage and refreshing foot spa. The first time I saw photos of this, I thought it was a dental chair. Haha. But you have no idea that these chairs came directly from US!  My free service is a Deluxe Feet which includes Soaking, Exfoliating Scrub, Cleaning, Soothing Massage, and Polish and Buffing. It costs Php380 for feet, and Php220 for hands. 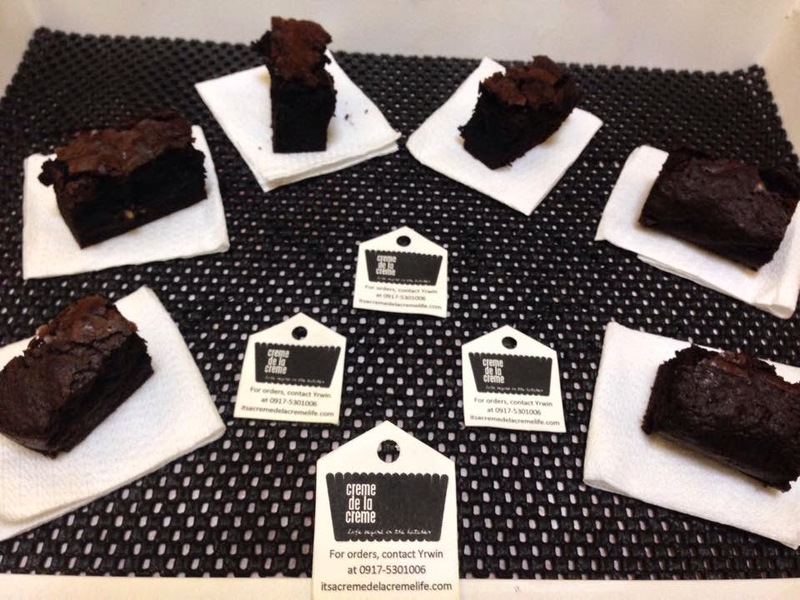 Imagine all of these for a total of Php600? Other nail salons would offer less and cost more! 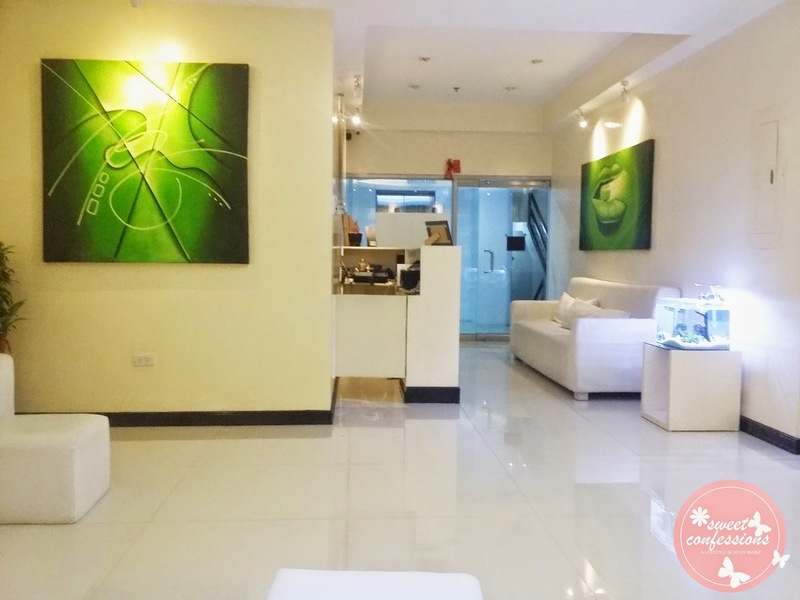 That's why I was impressed with the service, since the facility and the nail spa, as a whole, is very elegant that you wouldn't think the services are very affordable. When I entered the vicinity, one of the nail technicians already asked if I wanted a drink. There were different choices. Coffee, Iced Tea, Hot Tea, Mango Juice, and many more. I couldn't choose! But I decided to get a mango juice. Hihi. Food is also served. You have no choice but to get, because it looks very inviting to eat! Thanks to Croque Pastries for the cheesecake. I felt really pampered. First time seeing the very handsome owner, I was already pampered. Haha. Just kidding. The nail technicians (Ate Luisa-feet; Ate Diane-hands) are very gentle. The massage is very relaxing, and a bit ticklish because I'm not used to getting massage, but for a few minutes, it will really take away your stress. Not forgetting to mention that their jet chair has back massage features that adds a very soothing feeling. I honestly almost fell asleep. And by the way, they also let their guest wear a white lab gown to keep them clean while the technicians are doing their services. I feel like I'm a doctor. Haha! Nail tools are new and quite sharp so I'm watching the technicians very well so my nails won't get murdered. But they did their job very well, so thumbs up! Plus, they have branded nail polishes! 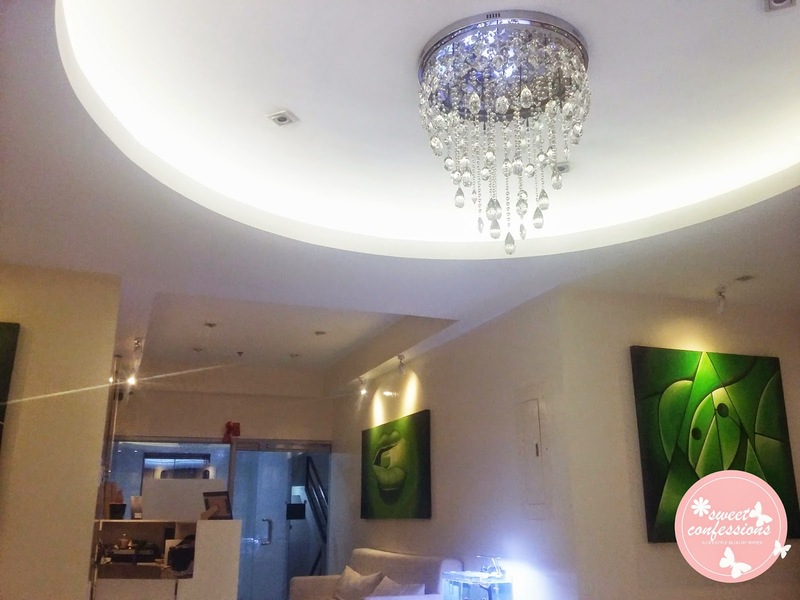 They also have a massage room where they do threading and waxing, and body massage. 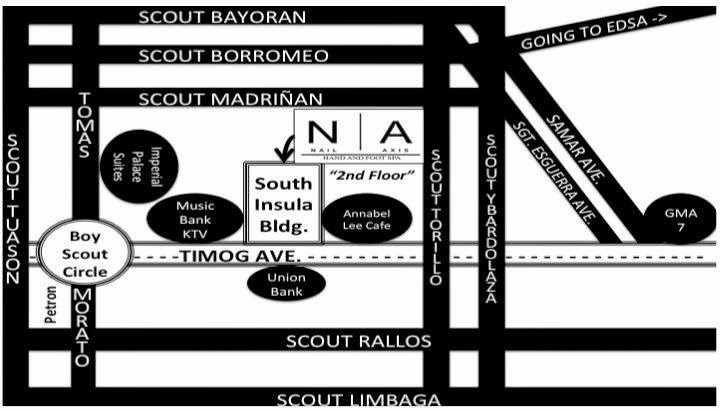 For the mean time, they only have one room but they are planning to add more to maximize space. And say hello to the Nail Axis crew! Of course I wouldn't miss a chance to have a photo taken with them since they really pampered me today. I must say that I really have "short-girl problems". See? I'm the shortest! Haha. 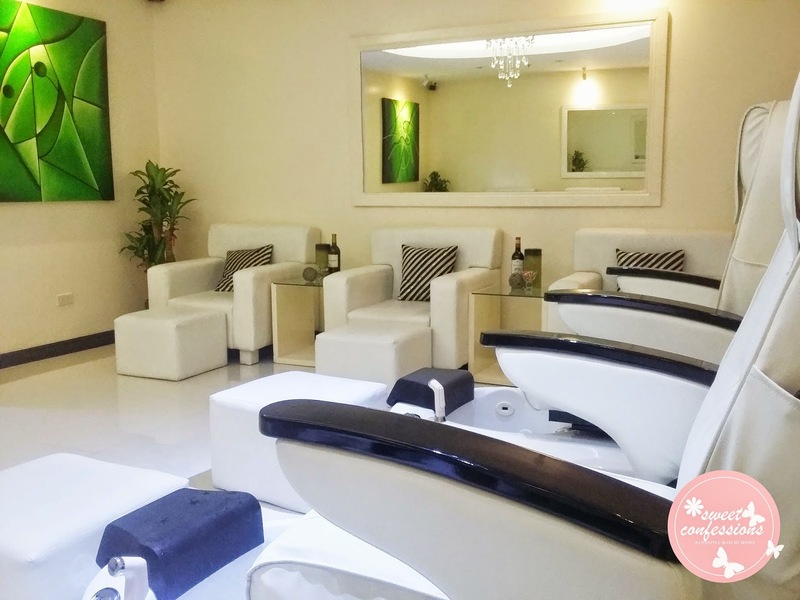 Thank you Nail Axis team for the luxurious pamper time. I would definitely go back, and let my friends try this one! 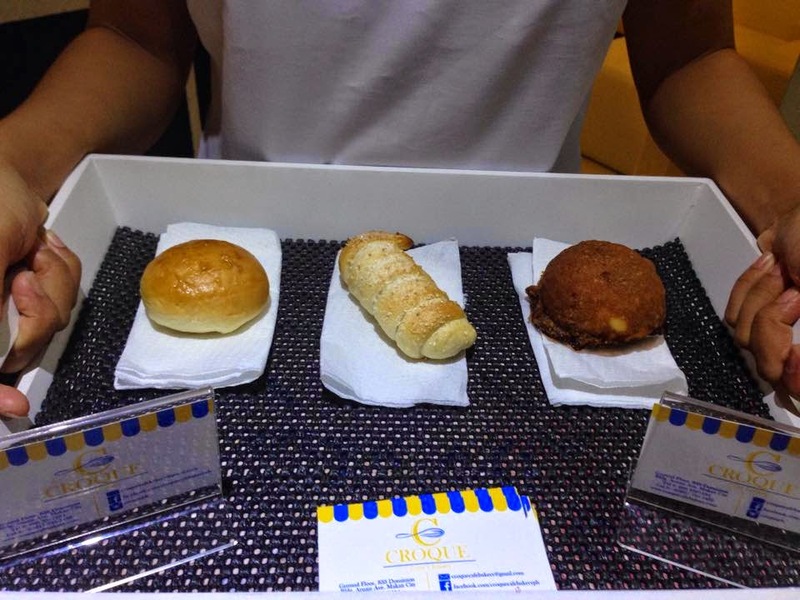 If you want to experience a high-end service at an affordable price, you must visit them! 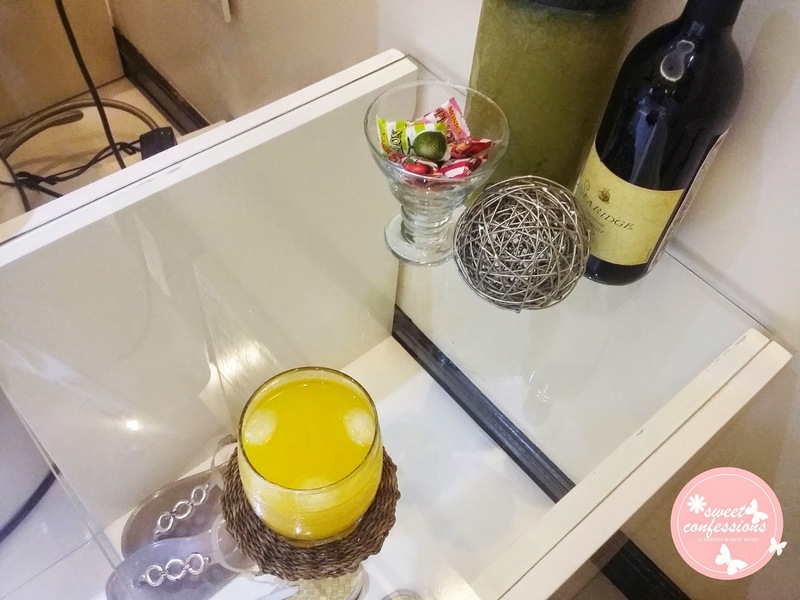 Disclosure: Sweet Confessions received these services /products for free and is sponsored by Nail Axis for editorial purposes, but my thoughts about the nail spa experience are based on my real experiences during the pamper session, and have not been influenced by the sponsor. Haha. Actually meron girl. Di lang ako nag wine. :) Pwede dn yata magpaorder sa mga resto.